For over 60 years, Plasticade has been a leading manufacturer of products that help companies grow. They have been so successful because their sign frames offer safety, promotional opportunities, and comfort for consumers and businesses alike. They also focus on developing processes that make their signage sustainable. This is why The Sign Studio is proud to carry Plasticade Sign Solutions for Los Angeles. What Does Plasticade Have to Offer? Signicade – The classic Signicade comes in seven different colors and can receive metal, plastic, or vinyl sheeting sign blanks. There are also miniature versions that work great on tables or countertops as point of purchase signs. Acrylic cover sheets come with the unit to keep paper signs clean. Wind Signs – Do not let the wind dictate who can and cannot see your message. With wind signs, your marker will never blow over. You just fill the base with water or sand. Springs attach the sign to the base and return it to an upright position. Sidewalk Sign – Sidewalk signs can display two messages at once on each side of the unit. This is an affordable and heavy duty option that can be stored easily. To deter theft, there are molded in tie down holes for chaining or wiring the base. 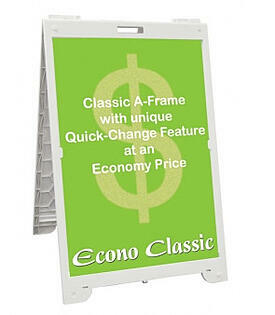 Econo Classic – This A-frame sign is one of the most inexpensive ways to display your sales, promotions, or other information. A stabilizing brace prevents closing of the sign face as well as adding a spot for a securing sandbag or other weight. 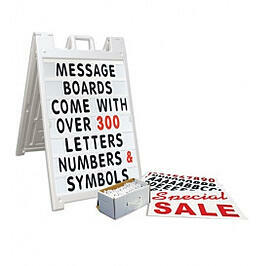 Message Boards – These corrugated plastic (coroplast) A-frame message boards come with tracks permanently attached and an indexed box for letter storage. The letter set contains more than 300 numbers and letters plus “SPECIAL” and “SALE” headers. 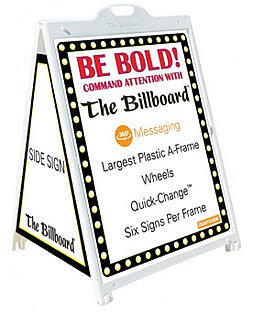 Marker Boards – These come in A-frame and single panel varieties. You can write your own message using the set of five neon wet erase markers that come with this unit. Plus, the markers can stand up to rain or other liquids without rubbing off. Instead, it comes off with glass cleaner. Whether you need yard signs or A-frame and sidewalk signs, Los Angeles businesses can turn to The Sign Studio for Plasticade signage. We take their sign frames and customize them for your purposes. With the Quick-Change technology, you can change out your message by just sliding it in, and it stays securely in place. There is no need for adhesive. Plasticade provides you with the frame, and we supply you with the inserts. We can custom print your message on any material. We can even include your company name, logo, and colors to help with your brandings. Are you ready to learn more about Plasticade sign solutions for your business? Contact The Sign Studio today for a free, no string attached consultation. Consumers are doing more and more research before making purchases these days. This presents a challenge to many of the brick and mortar stores trying to get by in the age of the internet. When it comes to making purchases, it is a golden age for customers with so much flexibility and so many alternatives available to them. However, for business owners, it is getting more and more difficult to keep up with all of the competition online and locally. A significant chunk of the consumer spending pie can be attributed to impulse buying. About 33 percent of all shoppers make a sizeable impulse purchase each week. These items have a median value of $30. This is where brick and mortar stores have the competitive edge over e-commerce sites. In fact, 40 percent of customers spend more money than planned in actual stores. This is compared to 25 percent impulse shopping online. So, how do you get a piece of this impulse buying? Well, a significant margin of sales for many businesses can actually be attributed to their POP signs. 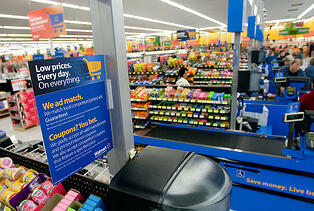 Los Angeles retailers have the opportunity to control the shopper’s experience, and signage is the way to do it. The first and most important detail in getting customers to loosen their purse strings is to have them see your product. But, how is this done? Eye-catching signs announcing promos and sales are still the tried and true method for getting your merchandise noticed. For this, you must pick your color palette carefully. For example, yellow and red have demonstrated their ability to attract attention, but what you choose may vary based on your audience or product. Demonstrate Value – With generous offers, you can make patrons see they are getting a great deal. For example, many big name retailers have begun offering “Buy two, get two” sales. This often gets shoppers spending more than they would have otherwise. Show off New Items – Consumers love to be the first to have something. This is why people wait in line overnight to get the latest iPhone. They are called “early adopters.” Help these shoppers out by clearly labeling your newest products with sharp, vibrant signage. Inspire a Sense of Urgency – Through limited time promotions, you can trigger people’s sense of urgency. For instance, many of our clients have “Today Only” sale signs to make impulse shopping more compelling. Whether it is custom vinyl banners or full color digitally print posters, The Sign Studio can help you with your impulse purchase signs. Los Angeles businesses come to us when they are looking to boost sales because they know that quality signage pays for itself. And, we have the experience to recommend solutions that will make any sales campaign successful. If you are ready to take your marketing to the next level, contact The Signs Studio today for a free consultation and quote. When you are done for the day, is there a way to keep marketing your remodeling company? What about your HVAC, plumbing, or roofing business? 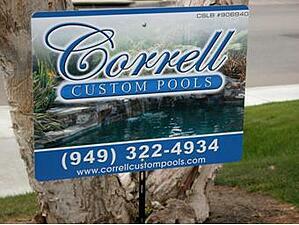 With contractor yard signs, Burbank, CA enterprises can build their brand after hours. Many contractors like the idea of being able to advertise on holidays, over weekends, and when inclement weather keeps them off of the jobsite for the day. 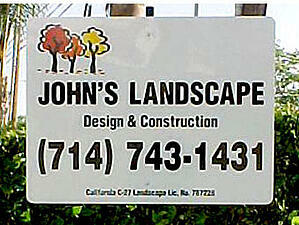 There are a broad range of looks for contractor yard signs. Most commonly feature a logo, a niche reference, the contact telephone number, and of course the company name. The name and logo typically take center stage with a phone number in large font at the bottom of the signage. Another option is to deemphasize the logo and name to draw attention to your phone number and niche. This is up to you. We can work to enhance the name recognition of your firm by incorporating the artwork from flyers you have been handing out into the yard sign. Do Contractor Yard Signs Last Long? Of course! An aluminum frame construction is used for all-weather yard signs. The longevity of coroplast (corrugated plastic) is showcased in other signs. Your message can be printed directly to the marker or onto vinyl that is then attached to the sign. You will be pleasantly surprised at the number of alternatives available to you for making a memorable sign that is one of a kind. How Do Yard Signs Work? Ask for permission to display some of your yard markers when you are hired to do a contracting job. General contractors and homeowners are typically amenable to requests like this. Then, you want to make sure that your signage is facing the street. For situations where it is more advantageous to place a sign where it can be seen by drivers, many contractors prefer to use double sided yard signs. The key to building your brand is to gain as many visual impressions as possible. This is done by presenting a consistent logo and message using as many different forms of signage and media as possible. As people see your company name, colors, and logo, you build brand recognition. With this comes trust, and consumers are likelier to think of you when they need your services. In the same vein, another popular option for contractors to get their brand out there is with contractor truck lettering and vehicle graphics. Your treated fleet of trucks can market your enterprise as you drive to and from jobsites as well as while you are parked at your latest project. Wherever you are working, market your company. By having contractor yard signs during your time working at a location, you can stay at the forefront of neighbors’ minds. 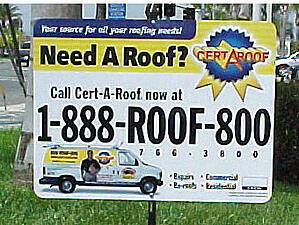 Plus, yard signs help you utilize your best advertising tool: the actual work you have performed. Put a name with a job well done by contacting The Sign Studio for a free consultation and quote on contractor yard signs today. Just about all public buildings in Burbank are required to have adequate accessibility and ADA signage. This includes signs in your parking lots as well as outside of your building and in. 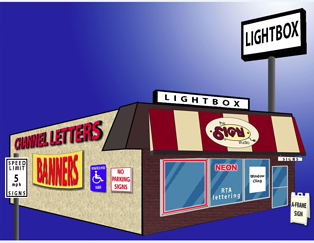 Fortunately, we are the top supplier of ADA and accessibility signs Burbank has to offer. We have the most innovative and highest quality portfolio of products to help your business meet the regulations set out by the Americans with Disabilities Act (ADA) along with the stringent local ordinances. Plus, we can create custom solutions for any job thanks to our fabrication process. These are also known as “severe weather signs.” They are used to direct people of different abilities to safe areas. These simple to understand markers share information on weather emergency procedures as well as identify storm shelters and evacuation routes. We also have area of refuge signs where those visitors to your building with disabilities can wait for assistance in an emergency. Pool / spa lift signs state instructions and rules for using ADA required pool lift equipment. According to the ADA Standards for Accessible Design, which went into effect in 2012, swimming pools must have more than one accessible means of entry. This includes at least one sloped entry or pool lift. Spas must have a pool lift, transfer wall, or transfer system. This signage helps those with disabilities access these amenities. The ADA requires organizations and businesses that serve the general public to let those people with disabilities bring their service animals into all parts of a building where customers and other patrons are allowed. Not all pets are service animals. With the appropriate signage, you can make it clear that service animals are welcome but that other pets are not. California imposes tougher regulations on businesses than the ADA does. For example, it requires that doors leading to men’s bathrooms have an equilateral triangle that is a quarter inch thick and has edges of twelve inches long. Women’s bathrooms must have a circle with similar dimensions. We are well versed on the CA Title 24 requirements and can outfit your establishment accordingly. Whether you are looking for specific OSHA stickers, Braille restroom signs, custom or general labels or signs, or accessible parking signs for your company, The Sign Studio will help you save money and time. All of our ADA and accessibility markers are manufactured in the United States and made from high quality materials. We have a comprehensive line of durable headers and application specific signs with Spanish, English, and bilingual language alternatives. Are you ready to make your facilities more welcoming for people of all abilities? If so, contact The Sign Studio to get started with a free consultation! Almost every work atmosphere has industrial hazards. You can help keep visitors to your building as well as employees safe by utilizing simple to understand hazard warning signs. At The Sign Studio, we pride ourselves on having a comprehensive selection of industrial and hazard safety signs for Los Angeles. In this entry, we will cover some of our most popular markers. There are a broad range of construction situations that call for safety labels and signs. These include lead hazards, buried gas lines and cables, PPE reminders and hazard warnings, and truss demolition, renovation, and construction. All of the hazardous waste labels we offer are printed on glossy vinyl. They are then covered with a clear layer of polyvinyl chloride (PVC) to make them chemical, UV, and scratch resistant. With the permanent adhesive, they are simple to peel and stick yourself, or we can install the signage for you. Both individual labels and economical multi-packs are available. If you do not identify potential slip and fall hazards in your workplace, you are leaving yourself open to worker’s comp claims or lawsuits. To identify spills, recently mopped areas, and other wet floor hazards throughout your building, use folding floor signs, stackable cones, and more. An ounce of prevention is worth thousands of dollars in legal fees. Also known as safety scoreboards, days without injury signs serve as positive reinforcement for your workers. These signs show up to date incident data. There are two main styles. Electronic digital signs can feature colorful safety slogans as well as display your company name. Dry erase aluminum signs are cost effective and come in three sizes. These markers bring a sense of pride to the jobsite and show that safety measures are effective. Whether you are looking for specific OSHA / ANSI stickers, custom or general labels or signs for your company, or constructions signs, you will save time and money when you contact The Sign Studio. All of our industrial and hazard signs are made from top quality materials and manufactured in the United States. We offer a full line of heavy duty headers and application specific signs with English, bilingual, and Spanish language options. Are you ready to boost the safety of your workplace? Or, do you need to update your old, worn out signs? Contact The Sign Studio today for a free and quick consultation and quote. 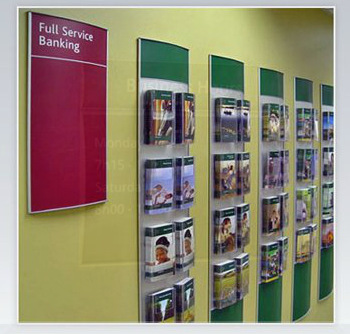 For sign shops around the world, Vista System sign fames are the favorite alternative when modular signs are needed. These frames were specifically created for wayfinding, informational, and promotional applications. Whether used in churches, offices, retail stores, schools, libraries, hospitals, or any other establishment, the Vista System product line is ideally suited for any atmosphere. Below, we will break down the new Vista System signage products for Los Angeles. Vista frame extrusions work great for creating wall mounted signs. They can take any flexible, flat substrate for a curved face design. 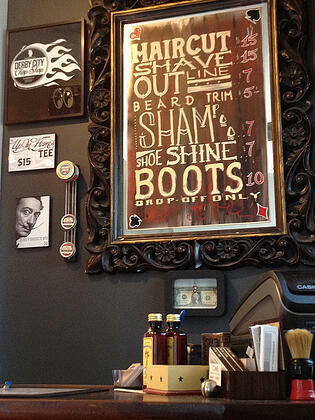 We can print your message on paper or vinyl and incorporate it into the wall frame. The 2015 product line of wall frames is packed full of options. One popular add-on is brochure holders. These provide for a professional, organized way to disseminate information. If your business is located within an office complex, the wall frames work great for displaying your company name, logo, and hours of operation. Do customers have a hard time finding their way around your building? With how quickly and inexpensively we can design and install Vista directories for your facilities, there is no reason for this. Once we install the directory, it is easy for you to change out inserts as tenants change. We can even professionally print the inserts for you. There are new directory designs that can be wall mounted or freestanding. 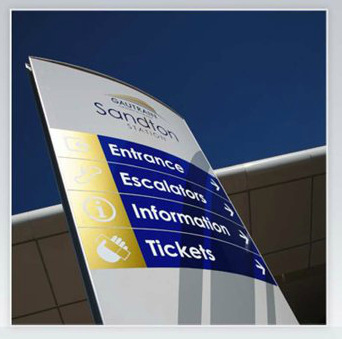 To create a wide array of horizontally curved, double sided suspended signs, Vista System’s standard sign profile is utilized with specially designed end caps. 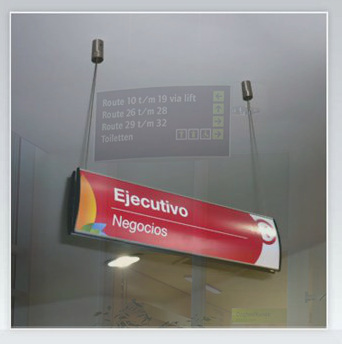 Sign inserts can be made from any flat flexible substrate, and clear, matte lenses are available with the suspended signs to reduce glare from interior lighting. 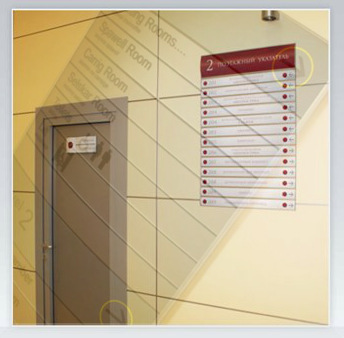 These signs are ideal for wayfinding purposes in larger buildings. Double sided pylons are one of the most versatile markers in the Vista System portfolio. 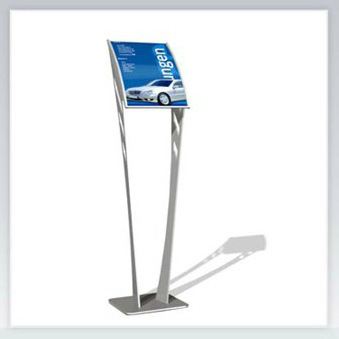 They are great for lobbies, directories, displays, and showrooms in any environment, such as campuses, hospitals, parking garages, libraries, office buildings, airports, and so on. Best of all, they can be used both inside and outside of your facility. With the new product line, you can even use the double sided pylons as affordable monument signs. We can supply you with just about any signage with MCFT technology. When you have a special application, we can work with Vista System to design the customized marker you need, whether it is wall mounted, standalone, or has unique specifications. We can even incorporating internal lighting. If you are curious in learning more about what Vista System has to offer, check out their latest presentation. Vista also has table stands, blade signs, triangular pylons, and much more. After an initial consultation in which we find out your vision and goals, we can recommend the best Vista System modular sign products. Los Angeles businesses can count on us to print top quality graphics to go into the frames and then install the signage so it will make an impact. Contact The Sign Studio today for a free quote and consultation on Vista System solutions for your enterprise.